Happy Holidays: I'm finally back in the studio - an update of the last week and a half. I'm finally back in the studio - an update of the last week and a half. Well, a lot has happened in the last week and a half, besides finishing my piece for the Ehag Emporium. Check out the Emporium if you haven't had a look already there is still some wonderful work available. Our daughter, Melissa, was here for a week and is now back in Toronto. Mike's girl friend, Nicole, is here for 3 weeks. Thursday, the day before Nicole's birthday Mike proposed and Nicole accepted! We were aware that this was going to happen. Mike has been planning the proposal and her birthday for quite a while. He asked me if I could make her a birthday chair and of course I said yes! Friday morning before everyone got up I put together the birthday chair. That evening we had a birthday dinner. This is the chair that I made for her birthday. Phoenix was here for the weekend. It was her birthday on Saturday, her mum had a party for her in the afternoon. We had a party for her and Nicole on Sunday. Saturday we cooked for Sunday's party. 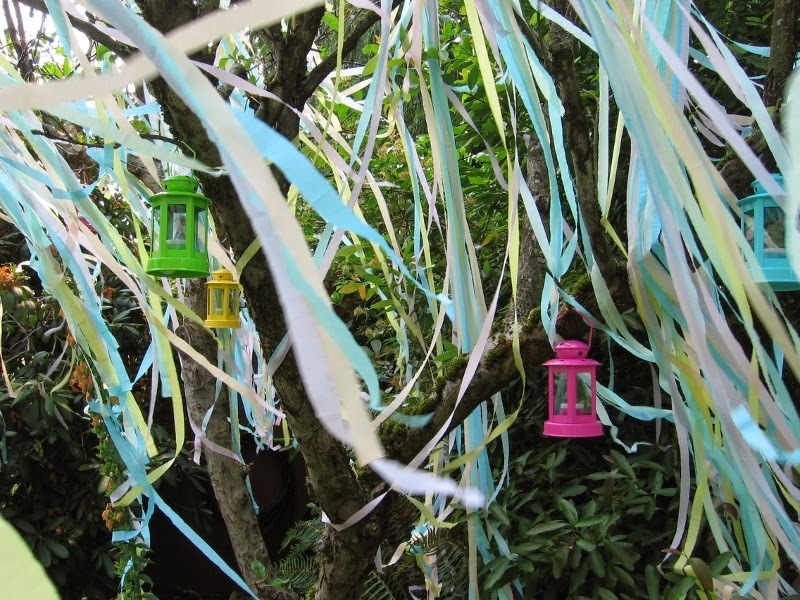 Sunday morning I decorated the crab apple tree with streamers. 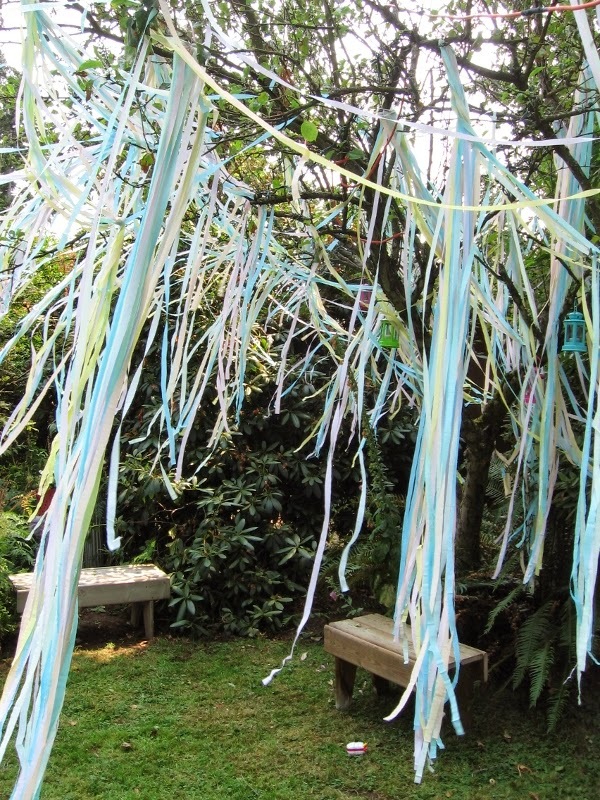 I had 24 bundles of hand cut streamers that I tied in the branches of the tree. I do tend to get carried away with decorating! Here is the finished tree, it was wonderful. There were lanterns with LED tea-lights tucked here and there in the branches as well. Here is another view. 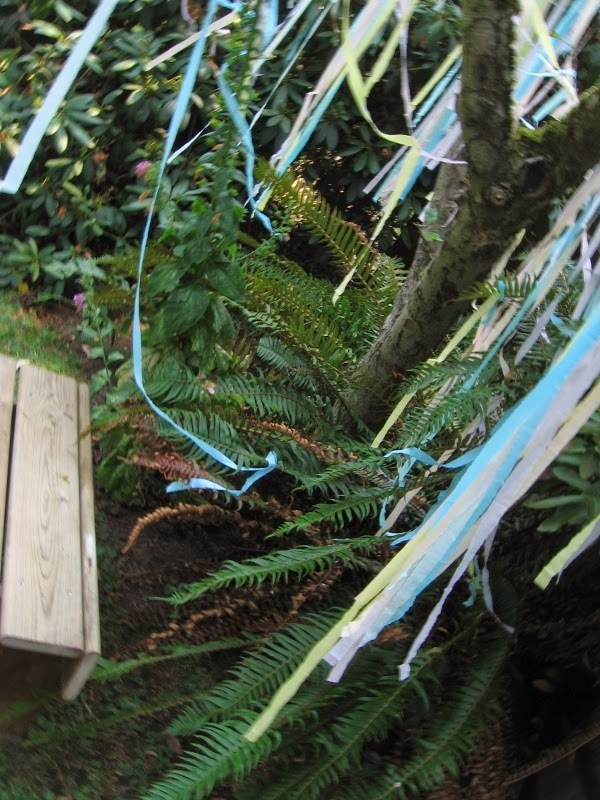 If you decorate a tree with streamers make certain that you use crepe papier and not ribbon. 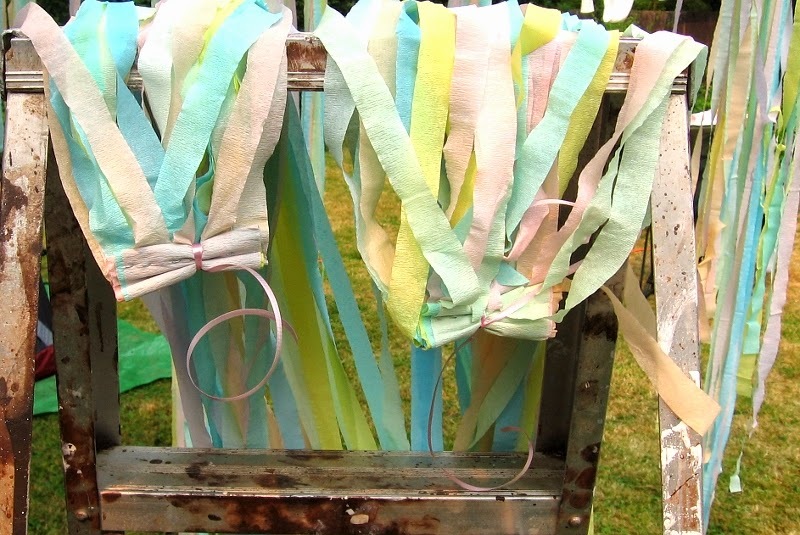 The wind, even gentle breezes for that matter, tangle the streamers in the branches. It looks very beautiful but if it was ribbon they would still be there not looking as pretty as the day of the party. Clean-up was a breeze. 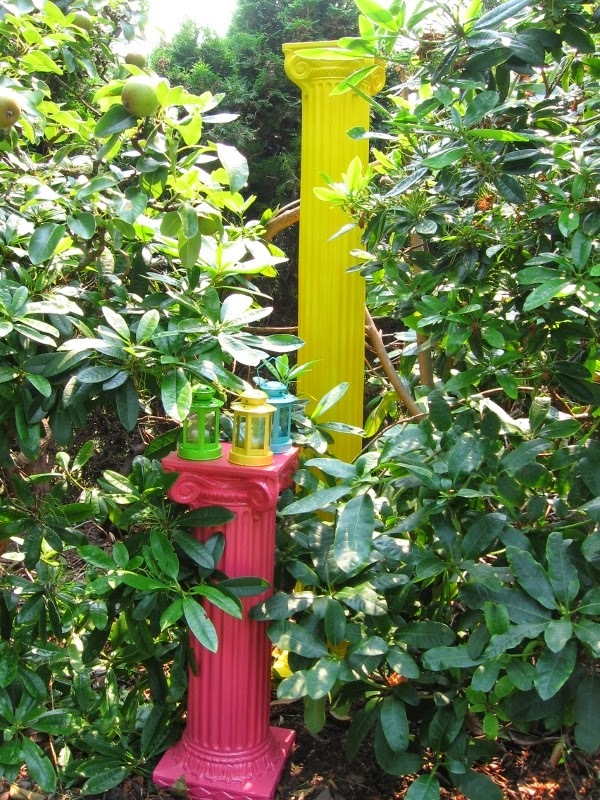 I also tucked some vibrant coloured columns in among the shrubs. Once in a while I made it into the studio. Things are back to normal sort of. I have some finished pieces sitting in the studio and I want to show them but I can't. You will have to wait to see them. There is a little something coming up in September and that is the first little tease for now. Black Cat and Jack have been very good and are staying out of the way but are helping when they can. No mishaps so far. I must get back to the studio, there is a lot to do.